Florida homeowner’s insurance can provide protection for a wide range of events and occurrences which cause damages. Most policies will include coverage for break-ins and vandalism, but not always. It is never a good idea to assume you are covered and then discover when you file a vandalism or theft insurance claim it is not part of your policy. In recent years, insurance companies are excluding certain types of coverage from their basic homeowners’ policies. The reason they do this is that it makes the cost of the policy more attractive for homeowners. Unfortunately, the low rate of the policy can often be rather misleading when you do not take the time to review the included coverages and any exclusions and ask questions. To avoid having theft and vandalism damage claims denied, it is highly recommended to review your policy now. Do not wait until you have to file a claim to find out. Otherwise, you could be left having to pay for damages out of your own pocket. If you discover your policy does not include break-ins and vandalism, you will want to have it added. What About Snowbirds? Are Vacation/Part-Time Homes Covered? If you are a snowbird and only reside in Florida for part of the year, or have a vacation home you visit for any a few months each year, then break-ins and vandalism may not be covered. Vandals and thieves tend to look for vacant homes, which makes them more of a risk to insure. Most insurance companies are reluctant to include this coverage as part of a basic homeowner’s insurance policy since the home sits vacant for long periods of time. If you look at your policy, there is probably a time-limit on vacancy restrictions, such as 30 or 60-days. However, there are special endorsements your insurance company may offer to ensure your home is sufficiently protected against break-ins and vandalism when it is vacant. These endorsements could require paying for a separate policy in addition to your regular homeowner’s policy. According to the English Oxford Dictionary, vandalism is the “action involving deliberate destruction or damage to public or private property.”1 What the definition does not include is the destruction or damage must have been committed without the owner’s permission or knowledge. For instance, you are renovating your home and your friend asks if he can knock down a wall you want to remove. You tell him to go ahead. As he is knocking out the wall, he also knocks out an essential vertical support beam and causes the upper floor and roof to fall into the home. Since you gave permission to your friend to knock the wall down, this would not be considered vandalism. On the other hand, you come home to discover several windows were broken and, upon entering the home, you see large holes knocked in the walls, along with another wall that was completely knocked down and which caused the roof to cave in. In this case, because you had no knowledge of the damage and did not give permission to anyone to do this, it would be considered vandalism. In some cases, vandalism could be a side-effect of a break-in, like broken windows, locks, or other damages within the home. When theft and vandalism both occur, they are normally handled as a single claim, with each item claimed being categorized either as vandalism or theft, but not both. Prior to calling your insurance agent, you will want to call the police to report the property theft and/or damages to the home. The policy will issue a report, which your insurance company may require. After reporting the incident to the police, contact your agent and let her know what occurred. It is beneficial to make a detailed list of any stolen property and damages to your home. You will also want to take pictures of the home prior to cleaning it up. 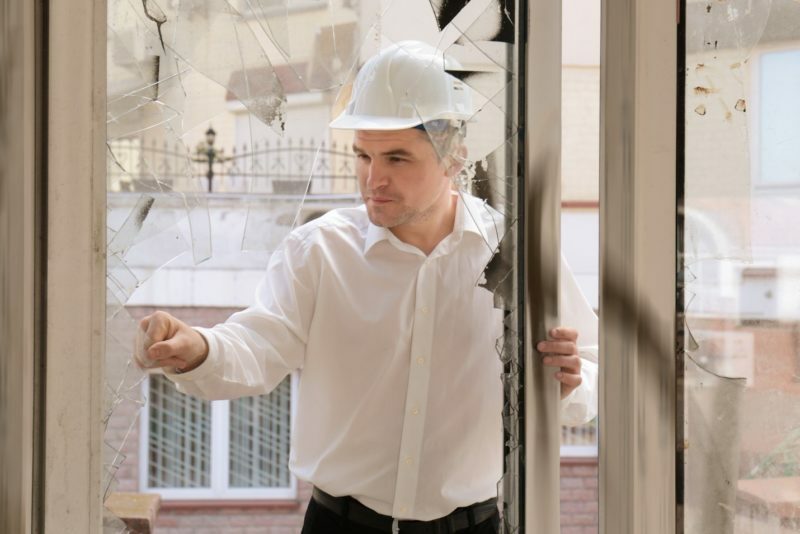 With any type of vandalism or theft insurance claim, it is your responsibility to secure the home to prevent further damages. For example, the robbers broke a window, and it is going to rain outside. You have a duty to cover the windows with plywood, storm shutters, or something to keep the rain out until you can get the window fixed. Your insurance company will not pay for additional damages caused by the rain. Why Did My Insurance Company Deny My Claim? If your insurance company denies your claim, it should have provided you with some sort of reasoning. If not, you have the right to inquire and find out why. In some cases, it could be a matter of the damages and costs to repair or replace items is less than your deductible. This is common if you have a high deductible. For instance, the cost to replace a broken window is $100 to $200. If you have a $1,000 deductible and need to replace one or two windows, then your claim would be denied. Yet, not meeting your deductible is not the only reason for denial. You know it’s vandalism, your insurance agent knows it’s vandalism, the police know it’s vandalism, yet your insurance company wants to get out of paying your claim. One excuse they like to use is that the damages are “normal wear and tear” and not actual vandalism. If this happens to you, you need to appeal the claim, but with help from an experienced insurance claim attorney. Your insurance company probably made the excuse on the advice of its own attorneys, in hopes you would not appeal their decision. By obtaining your own legal representation, your insurance company will know you are serious and be less inclined to give you the run-around. Why Did My Insurance Company Only Pay Part of the Damages Claimed? Another little tactic your insurance company will use is to disallow certain parts of your vandalism or theft insurance claim. They might say there were existing damages that made it easier to vandalize or break into the home. Since these things were pre-existing, they will not pay to have them repaired, but will only cover any new damages caused when the home was vandalized or broken into. Why Is the Check Less than the Costs to Actually Replace or Repair the Damages? You have actual cash value coverage, not replacement cost. It can be confusing for most people to understand the difference between the two types of coverage. Actual cash value sounds like you will get the actual amount the property is worth, yet this is not the case. Instead, the amount issued takes the current replacement cost and subtracts depreciation. Your insurance company’s adjuster undervalued your claim. If the adjuster overlooked specific damages or undervalued the costs to repair them, it could result in a lower check amount. Remember, the adjuster probably works for the insurance company, so her task is to value the claim for as low as possible. You forgot to subtract out your deductible. We have all made this mistake and forgotten that the deductible is subtracted from the total amount of the insurance settlement before the check is issued. So, if your check seems $1,000 off, this is probably why. What if I Disagree with My Insurance Company—Now What? If you are not happy with the settlement being offered, or your claim was denied, or you have other issues, then you will want to get help from a Florida insurance claim attorney. It is highly recommended you contact your own attorney after calling the police and notifying your insurance company that you will be filing a claim. One sneaky little trick insurance companies like to do during the initial interview with you is to get you to admit fault. They might ask whether you left the door or window unlocked. They could try to get you to admit the home already had prior damages before it was vandalized. The moment they do, things won’t go as well for you. They will disallow damages or even deny your claim. By speaking with an attorney ahead of time, you will be prepared on how best to answer questions when filing your claim. In addition, your attorney can come to your home to do his or her own damage assessment. This assessment will let know how much you are entitled to be reimbursed by your insurance company for your damages. For additional information and help filing theft and vandalism damage claims, please feel free to contact Silver, Bass, Brams & Daniels at 1-888-897-1786 to schedule a consultation appointment with one of our insurance claim attorneys today!